Does anyone else feel like they've lost a sense of time, let alone what day of the week it is lately? I've been staying at my parents' place for the past week for the holidays, and without my regular routine I feel a bit thrown off track - but in a good way! It's been so nice to just relax and spend time with family, even though it means I haven't been cooking as much or keeping up with reading all my favourite blogs! Since I'm sure many of you are also enjoying some time away from your computers, I thought I would just share a simple idea today that hardly qualifies as a recipe. If you're sick of Christmas cookies but still like having treats around, or if you're looking for ideas for a New Year's Eve party, I'd recommend these rum and chocolate dipped dried apricots! 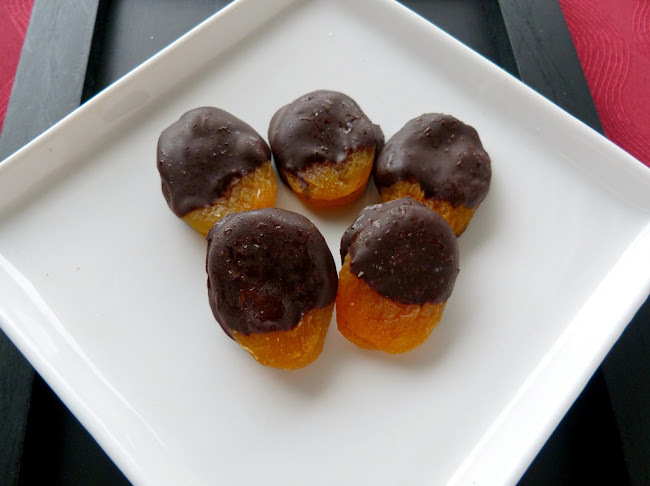 These were inspired by the popular chocolate and sea salt dipped clementines that I've seen around the blogosphere, but obviously I changed the base to dried apricots and added in a bit of booze because, after all, it is still the holidays! To make these little treats, you just have to soak some dried apricots in hot rum, let them dry off a bit, and then dip them in melted dark chocolate and let them harden. If you want to spice them up a bit, feel free to add a dash of cayenne or paprika to the chocolate, along with a sprinkle of sea salt on top of the chocolate for that sweet and salty combination. I found that each of the flavours - the rum, spice, and sea salt - were fairly subtle on their own, but they all came together nicely for a fun and unique little treat! Note: The rum taste isn't very strong, but if you don't like rum, or don't want to include alcohol in this recipe, then you can skip that step and just dip the dried apricots in melted chocolate for an even simpler treat! Place the rum in a shallow bowl (I divided mine into two small glass bowls). Heat in the microwave for 15 seconds (this will help the apricots soak it up better). Add the apricots and submerge them as much as possible in the rum (some parts may still be sticking out). Let soak for at least one hour, turning the apricots occasionally so that they soak evenly. Remove from rum and let sit on a foil-lined baking sheet or plate. Dip one end of each apricot in the melted chocolate and place on the foil to harden. Once you’ve done a couple of apricots, sprinkle a bit of sea salt over the chocolate before it dries. Repeat with remaining apricots. Place the whole tray in the freezer until the chocolate hardens. Store at room temperature (Note: I stored mine in the fridge for a while, which seemed to make the salt disappear). What a lovely combination.. I especially like the addition of rum:) I'm behind in blog reading as well, but hey, it feels great to slow things down a bit now and then..
Mmm I loved these! Loved the combination of dark chocolate with dried fruit, and the rum and sea salt just made them extra good. And I like to think they were one of the healthier snacks I had this Christmas! Thanks, glad you liked them! I've definitely been eating more snacks and treats lately, but I didn't feel bad about snacking on these! 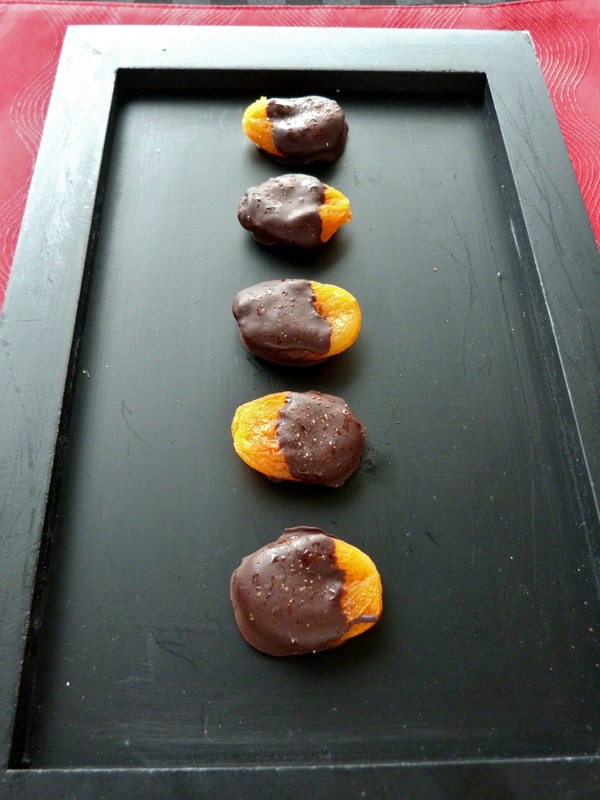 I make those chocolate dipped clementines constantly--they are one of my favorite light desserts! I think I'm going to have to try these next. I love the idea of plumping up the apricots with a bit of rum! I haven't actually tried the clementine idea myself yet - I will have to get on that!